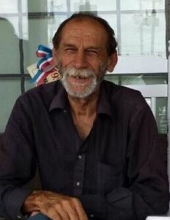 Steven Slavych was born on March 25, 1950 in Musingen, Germany; on March 17th, he suffered a massive stroke and after 11 days in the ICU at Methodist Hospital in the Woodlands, he passed on March 28, 2019. We were so happy that he made it to his birthday and that we were able to spend those extra days with him letting him know how much we loved and cared for him. He was a very proud man and he loved to joke around. He enjoyed fishing and loved visiting his favorite local hangouts for a hot cup of coffee. But his greatest joy of all was spending time with his children and grandchildren. Steve was proceeded in death by his parents (Anna & Ilko) and two brothers (Peter & Johnny). Those left behind to honor his life and share their memories are his daughter (Alycia "Michelle" McNiel) and his son (Cody Slavych); granddaughters (Ashley & Kiley) and grandsons (Oliver & Ciel); his sister Irene and husband George, his sister Helen and husband Bob, his sister Theresa and husband David, his sister Anna; his sister Rosie and husband Jude; his brother Michael, his brother Vasyl and wife Denise, his brother Merko and wife Michelle, and his brother Ilko Jr.
Steve proudly served his country as a U.S. Marine from 1969 to 1971 where he fought in the Vietnam War. A private military service will be held at the Houston National Cemetery at a later date. There will be a memorial held in his honor for friends and family and any others who would like to pay their respects. Lunch will be provided to those who are planning to attend which will include some of his favorite dishes. To plant a tree in memory of STEVEN SLAVYCH, please visit our Tribute Store. "Email Address" would like to share the life celebration of STEVEN SLAVYCH. Click on the "link" to go to share a favorite memory or leave a condolence message for the family.